Accompanied by Q, that immaculate collection of our Lord’s sayings that so many “Biblical Christians” routinely ignore, a man could find his way through this life with nary a worry. For this uncontroversial text, attested to by a great cloud of witnesses for nearly 2,000 years, forms the cornerstone of Christianity. In fact, it is such a powerful collection that it is said at pulpits across the world that it, along with the Gospel of St. Mark, shaped the formation of Ss. 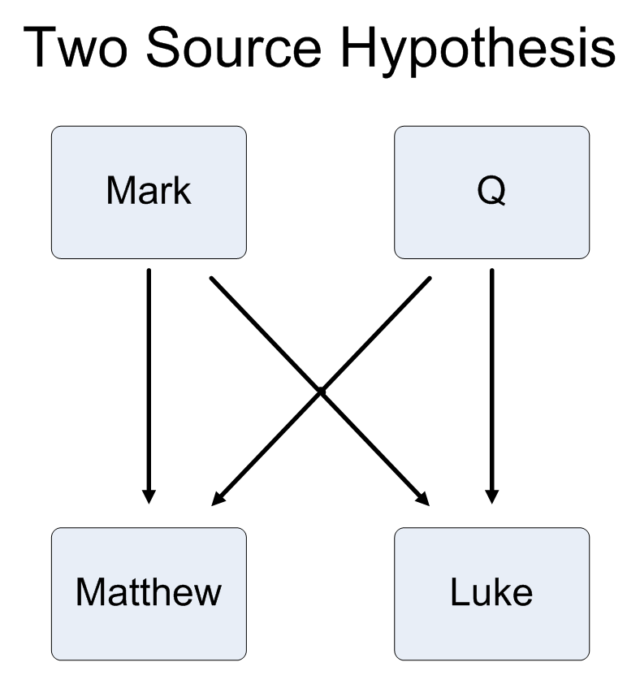 Matthew and Luke’s gospels. No doubt this is why children are taught from the earliest age to appreciate the sweet science that is textual criticism, for without it the careless scribal errors of ages past may very well shape the souls of those living today. The horror. Facetiousness aside (well, not entirely), nobody today contends that Catholics and Orthodox alike are woefully ignorant of the Bible. While some schoolchildren are fortunate enough to be handed cute songs and rhymes to assist them in remembering the titles of the Biblical texts, a vast majority of them will never read a single verse of Scripture outside of what may be contained in either their hand Missals or quoted in a “spiritually uplifting” book. When I come across a Protestant at one of West Michigan’s numerous Christian-themed coffee shops, I have to confess off the bat that they have bells n’ smells Christianity beat when it comes to the Bible just before reminding them that the existence of the Bible presupposes the Church which canonized it. Most folks, particularly young folks, aren’t terribly impressed by that, and for good reason. For if I or any other Catholic/Orthodox take such pride in the production of the Bible, why don’t we make a firmer effort to read it? Woe to us, I suppose. What, I wonder, would become of Christianity were the Bible to be read and read often. Would there be less sin? Would there be a greater thrust to remake the world and evangelize those lost to heathenry? Might streaming television and video games go the way of the dodo as people spent their well-earned hours of leisure in heated but charitable discussions over the meaning of Job or why God would allow his most obstinate prophet, Jonah, to become His most successful one? Perhaps the only magazines and books to be produced would be Biblical commentaries, each one invested not so much in scoring polemical points or advancing careers, but rather disclosing the meaning of the single most important book (or, rather, collection of books) in human history? Maybe, under the guidance of the Word of God, a real effort would be made across the nations to restore all things in Christ. Or perhaps people would just find more reasons to despise, vilify, and ultimately murder one another—just like in the good old days. Sheen goes on—in the spirit of papal documents such as Pope St. Pius X’s Fin Dalla Prima Nostra and Pius XI’s Quadragesimo Anno—to argue for greater cooperation between capital and labor, noting that neither the right to profits on the one hand nor the right to organization (or unionization) on the other are absolute; both are subservient to the common good. Where Sheen may have fallen short is with regard to his belief that democracy is the best way to ensure that the rights of capital and labor are protected without infringing upon the common good. Although Sheen is right to note that historically political power was held in the hands of capital, his faith that greater democratization would provide labor with a greater balance of power did not come to fruition. Sheen did not anticipate the extent to which capital, through control of advertising, mass marketing, and social media, would be able to manipulate the voting direction of labor, leaving capital firmly in control. At the same time, it does not appear that Sheen anticipated the extent to which capital would go to curry favor with Christianity, specifically Catholicism. 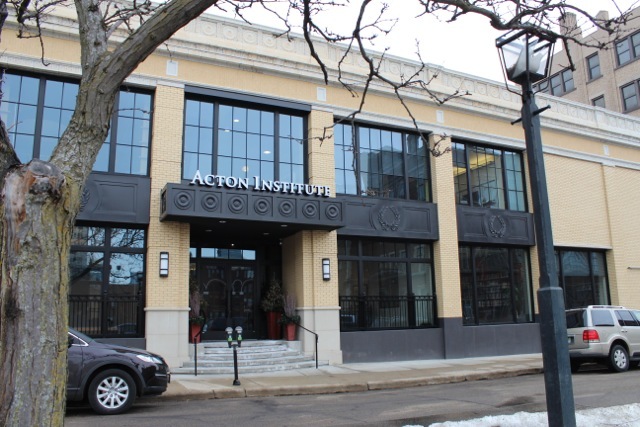 In the United States today, the Acton Institute—which is run by and directed primarily toward Catholics—houses some of the leading Christian apologists for capitalism, specifically the “good” of the free market, unfettered rights to profits, and the conflation of the common good with material social-welfare gains. No doubt Sheen would be horrified to learn that an institute presided over by a Catholic priest would come out against minimum-wage laws, promoting so-called right-to-work legislation, and argue that a “just wage” is the prevailing market wage. To Acton, of course, this is a non-issue; Sheen was not an “economic scientist” in the way the denizens of the Cato and Mises institutes allegedly are. Sheen’s concerns, by Acton’s lights, are those of an ill-informed man relying on theological and doctrinal statements which, by virtue of their “unscientific” nature, can be left to the side by faithful Catholics. As I mentioned in my previous post, many Catholics today, particularly in the United States, are fundamentally confused about what the Church actually teaches concerning political economy. 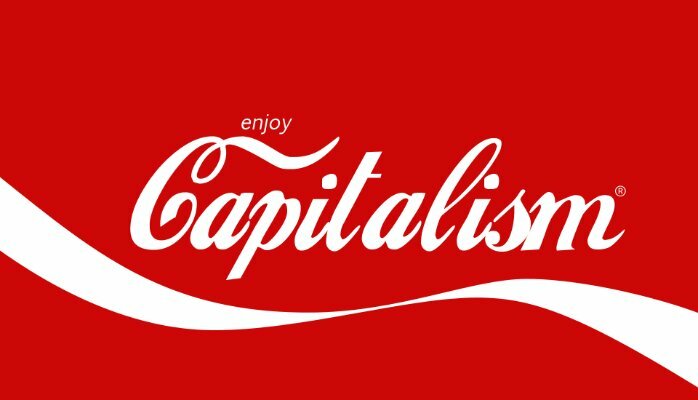 A certain brand of youngish Catholics, rightly concerned with the ubiquity of capitalism, recently made a serious intellectual and moral misstep by believing that socialism (of a naively Marxist variety) will save them. Others have chosen to give up the fight altogether by aligning either with Actonite ideology or embracing, in one form of another, the emptyheaded economic nationalism trumpeted by the Trump Administration. There have of course been some nods here n’ there toward the poor, the underclass, the downtrodden, etc. all in the name of Pope Francis’s ostensible “papacy of mercy,” but much of that has come from the liberal wing of the Catholic Church, the same which believes that entitlement programs and centralized redistribution is all it takes for a country to align itself with the tenets of the Gospel. Ultimately, it is hard to shake the notion—the fear—that Catholics today no less than Catholics in the previous decades have lost their sense of what being here is for. Material concerns are prioritized over spiritual ones, and “things economic” have replaced “things moral.” Granted, in an age of iPhones-for-all and incessant streaming services which banalize culture just as easily as they corrupt the intellect, there is little reason to be this dreadful state of affairs. It’s important to keep in mind that for a certain breed of Catholic between, say, 21-35, posturing on social media with indistinguishable microbrews and books they’ve barely read is an easy substitute for the hard work of restoring all things in Christ. Prayer has given way to pedestrian Tweeting and man’s final end is no longer Heaven, but the special kind of hell that is social recognition. A strange phenomenon seems to be overtaking the Catholic world, or at least that minority portion of the Catholic world that spends way too much time on web-logs, online magazines, and other forms of social media. Just as it seems that conservative-to-traditional Catholics are prepared to shake off liberalism once and for all, there has been a noticeable decline in thoroughgoing Catholic critiques of economic liberalism. That is not to say they’ve disappeared altogether. The Distributist Review, for instance, still publishes, and Thomas Storck has a new book out. However, the waters have been muddied a bit. The ill-conceived, ill-designed, and ill-executed Tradinista! “project” (debacle) seems to have taken the wind out of some Catholics’ sails. Maybe a few too many have bought into the idea that to oppose markets is to embrace socialism, something which the Tradinistas! had no qualms over. Some thought, with the election of Donald Trump, that Catholics no less than other conservatives would begin to embrace economic populism. The problem with this “hope” is that few seem to understand what economic populism is. Moreover, Trump isn’t really interested in that line of thought anyways; his presidency is one built upon contradictions and fueled by the ever-dwindling hope that the blue-collar workers and rural poor who helped get him elected will be better off economically by 2020 than they were in 2016. Catholics, as best as I can tell, haven’t paid much mind to such things. Liberal Catholics, of course, continue to advocate for economic centralism with a thick, federally backed menu of entitlements and welfare transfers. They are rightly suspicious of not simply economic populism, but the rolling back of government funding for everything from healthcare to food stamps. They see Trump’s economic vision, and the economic vision of the Republican Party, as antithetical to Catholic social teaching (CST). Maybe. The problem is that instead of critically reviewing the economy as a whole, seeing where liberalism has created serious moral and material pitfalls, they naïvely look to the federal system to correct market failures and inequality. Starting from the top and working back down is exactly what CST recommends against; but unsurprisingly the liberal Catholicism’s ignorance of true social principles matches that of their slightly estranged conservative brethren. Traditional Catholics, historically, were the torch bearers of CST, albeit with some occasional blind spots. Unlike conservatives who love to latch onto the “Lockean” portions of Leo XIII’s Rerum Novarum and rework John Paul II’s social magisterium into an apologia for free-market capitalism, traditionalists see a golden thread in CST running from the pontificate of Pius IX all the way through Pius XII. Rerum Novarum is great, but so, too, are papal documents such as St. Pius X’s Notre Charge Apostolique and Pius XI’s Quadragesimo Anno. The Catholicism nurtured by these cornerstone teachings and, indeed, the Church’s millennia-long theological and philosophical reflections on society, politics, economics, etc. produced, in the first half of the 20th century, a rich body of literature on (re)building Christendom from the ground up. Where has that thinking gone today? Sadly, the temptation to be “relevant” has gripped the contemporary Catholic imagination, even the imaginations of those who find so many aspects of liberalism abhorrent. These Catholics will go on about the importance of the environment, abolishing the death penalty, and other social-justice issues, but they have little to say about how to make small businesses flourish; the corrosive nature of the ostensibly “free market” on communities and ecclesiastical life; the immorality of peddling inessential goods and services on Sundays; and so on and so forth. They are silent on the social rights of Christ the King and perils of democracy. They may speak of what “the Gospel” dictates while texting on their smart phones, filling their online shopping bag at J. Crew, and positing pictures of their dinner n’ drinks online in order to broadcast an unearned air of “sophistication.” If this is the brain trust of the Catholic Church and, more specifically, CST, then any hope of vanquishing economic liberalism as a justifiable “option” for committed Catholics is, at best, a fool’s hope.